Send our Elite Gourmet Basket and treat everyone to a bountiful assortment. We only select the choicest fruits and gourmet foods for each basket. Our fruit picks may include oranges, apples, bananas, pears, kiwi, grapes, nectarines, peaches, grapes, and mangos. Gourmet items may include crackers, smoked sausage, nuts, cheese spreads, preserves, and candies. There's definitely something for everyone! Exact basket and fruit/gourmet selection may vary by season and delivery location. 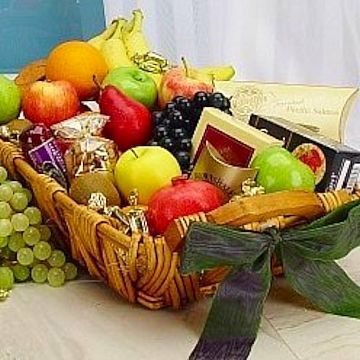 Elite Fruit and Gourmet Gift Baskethas been purchased most frequently by our customers for the following occasions: Get Well, Birthday, Sympathy, Thank You, and Thinking of You.